Can You Enjoy Clear Smile Correction? If you have crooked or crowded teeth you’ve probably dreamed of obtaining a more even smile. However, you may not exactly be eager to wear metal orthodontics for 18 months to 2 years. But what if you could enjoy clear smile correction? With Invisalign and ClearCorrect, we can offer practically invisible orthodontics treatment. 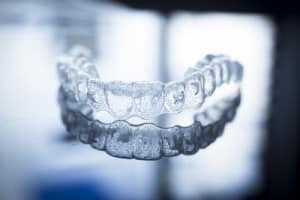 Question: How long will I wear the aligners? Answer: You will need to wear the clear plastic aligners everyday for between 20 and 23 hours. We only suggest removing them for meals, special occasions, or when brushing/flossing the teeth. The total treatment time will take between a year and 18 months. The exact time will depend on the cause and severity of your misalignment. Question: Will I need to avoid certain foods? Answer: No. Since you can remove the aligners prior to meals, you can eat without changing your diet or avoiding certain foods. With braces, hard or sticky foods can damage orthodontics or become trapped in them, increasing the risk of tooth decay. Answer: Yes. The plastic aligners are custom-made, leading to a comfortable fit. We take impressions, x-rays, and photographs, which are sent to an Invisalign or ClearCorrect lab, where a series of aligners are fabricated. You then wear one everyday, upgrading to a new set about once every two weeks. Question: What are the advantages over braces? Answer: First, they are nearly invisible, which adult and teenage patients always appreciate. In addition, brushing and flossing your teeth is easier, often improving oral health during treatment. Finally, the treatment requires fewer office visits and corrects smiles in a shorter time frame when compared to metal braces.